Melt butter in a frying pan on medium-high heat and add the cut pear. Stir in and add light brown sugar, cardamom and lemon zest. Reduce heat to medium and cook for 12 minutes. Add water and continue to cook until the juices thicken like a syrup. If you see it is still too liquid, dissolve the cornstarch in a tablespoon water and add to the pears while stirring. It will slowly thicken. Add vanilla, turn off the heat and let cool. The filling should be at room temperature before adding to the dough. Separate the egg. Lightly beat the egg white in a small bowl. In a separate bowl, combine the egg yolk and milk. Roll out the dough and cut it into squares (or circles), about 4x4 inches. Add 2 tablespoons of the pear filling in the center of each square and brush a little of the egg white on the edges. Fold the dough to create rectangles and seal the edges with a fork. With the tip of a knife, make a few small cuts along the top. Place the turnovers on a baking tray lined with parchment paper. Brush with the milk and egg yolk wash and sprinkle sugar crystals over the top. Bake for 30 minutes or until they have a pretty golden color. Let cool on a rack. Serve and enjoy! If you don’t have cardamom powder, you can use 3 cardamom pods. Remember to remove them from the pears before filling the dough. Don’t have pears? Use apples! If you could teleport to my house and smell the incredible aroma that fills the kitchen while these pastelitos are in the oven, you would feel as if you were in the most sophisticated pastry shop, with smells of vanilla, cardamom and sugar. It’s delicious! 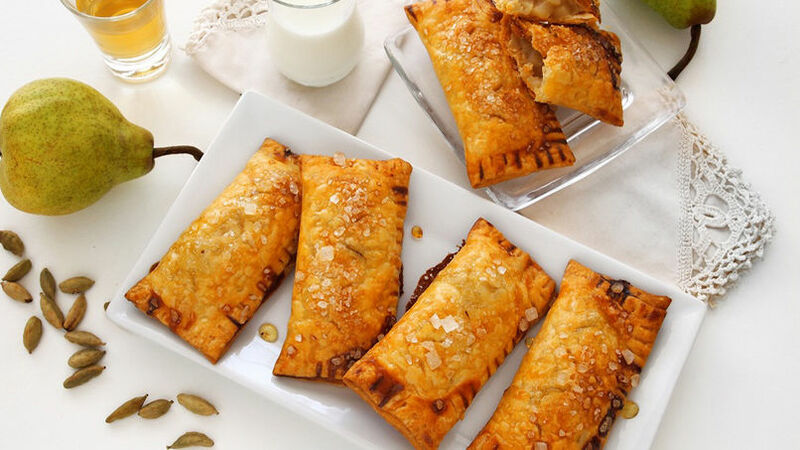 The best part is that these turnovers are very easy to make. The magic comes with Pillsbury™ and their ready-to-use dough; they save me a lot of work and make life simpler and tastier. All we need to do is make the filling for these turnovers and you can even make it ahead of time to make the process even quicker. And now you’ll have to forgive me but I must go. My pear turnovers are ready and waiting for me to finish writing this… and the truth is that I can’t wait to enjoy one. I suggest you make them and I know you will love them.